The week 6 problem. – Dirty wet dog , boats and sailing. DirtyWetDog July 10, 2017 July 31, 2017 Blog post, Fitness blog. Fitness blog, just going into week 6. For many people that make new years resolutions and start a fitness and diet regime in January it’s often a sorry failure by about week 6 and by that point many if not most have got thoroughly fed-up with the pain and the lack of progress. At least that’s the view of the personal trainers at the gym where i used to train and where i accidentally started the rehab process when i had my gastrocnemus tear some years ago. It seems that good intentions don’t carry people very far and that if there is little weight change and or change in their physical appearance and the work of going to the gym, running or whatever is painful and tedious then its just too easy to quietly forget it and do….whatever isn’t painful and tedious instead. At the 6 week mark now myself i have to admit that i had a very bad week in week 5 with one strong workout followed by the rest of the week dogging me with back, ankle, knee and neck pain and generally poor sleep such that i absolutely needed a day off at the end of the week. One recovery day worked a treat : my knee is less swollen and hopefully this week i can get that seen to. Right at the end of the week my weight looked promising but i forgot to do a dry/naked weight before my first drink of the day (not the meths) so i weighed this morning at the start of week 6 : 97.8 kg and my belt slipped in another notch (about an inch). Also at the end of the week i did a successful 24 hr fast with the ketosis really apparent all day but followed by a very satisfying meal and then today its straight back into ketosis again. What i want to talk about today is an exercise method that i have picked up again : something i used to do a lot called ‘rucking’ and its back on the training menu here. Rucking then is a simple technique (but can be brutal) of training by carrying weight, preferably quite a lot of weight and preferably over difficult terrain, especially hills and over distance. As with all training its not wise to suddenly jump in with 100 lbs in the bag and try and do 10 miles with it but to treat it in just the same way as any other exercise regime ie start moderate and build it up in any of the dimensions of weight carried, distance, slope (hills) and difficulty of terrain. At my peak when i did this in preparation for long distance hiking i was carrying loads in the 70-80 lb range for about 2 miles and always out of a steep river valley and yes that can be brutal….today my circuit is 20 minutes in total with a maximum weight of 50-65 pounds and up/down a gentle slop but one that is sufficient to get me pumping. Its a very strong exercise on the ‘cardio’ side but it does also push some muscle groups just into the glycolytic/lactate pathway and that is a very good pathway (with other exercises) for muscle development especially the big stuff in the lower body. It goes without saying that its also tough on the shoulders and works the back hard too so at this stage i am being a bit careful. It is also my ‘natural’ technique for scavenging firewood : i go out with an empty pack and my bush saw and retrieve deadfall of which there is a plentiful supply around here. 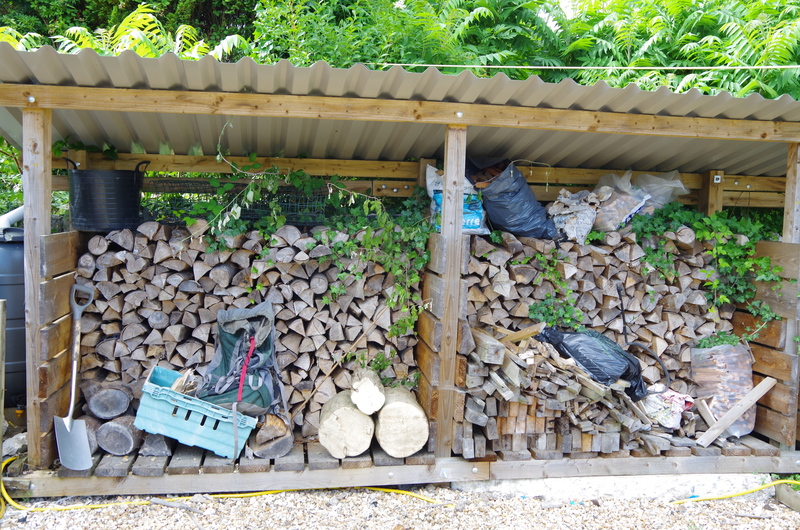 The way it fits into my training now is that i intend to do a total of 100 sessions of this over the next 10 weeks or thereabouts (today will be take me up to 12/100) at around 3okg carried per hit and sometimes more i will already have carried some 3-400kg of firewood and that is valuable work in itself : beats the gym hands-down. Today i intend to combine rucking into my general workout : maybe warm up and do a first ‘ruck’ then do a set of press-ups and a set of deadlifts , then repeat a few times to keep the overall workload up. Just as a side note i have also been trying to progress the number of press-ups each time i do them, i am now up to 15 in the first set which fades a bit on the second and third but it means that i am now aiming at 50 a day every day as i can slip a set in at any time i have a useful floor and not surrounded by people. Cooldown (walk/jog) in lane. total distance 5,000 steps through exercise. Water, protein shake and coffee to finish.